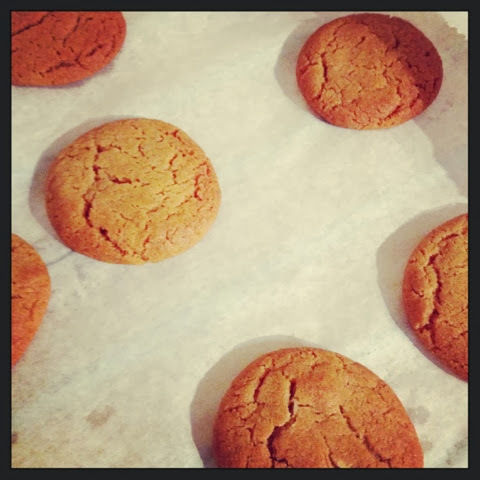 Last week I became a bit obsessed about making Ginger Biscuits! I wanted to make something for a volunteer afternoon at work and so I decided on biscuits rather than cake and of course I had to have a dry run earlier in the week and so my colleagues got a very biscuit friendly week! They are so simple to make and you are most likely to have most of the ingredients already which is always a good start. They do go hard really quickly, which I like, but you do have to have strong teeth or a good cuppa to dip them in! I also added stem ginger to mine to make them extra Gingery, but you can leave out if you prefer. 1. Preheat oven to 180*C and grease baking sheets. 2. Melt butter, sugar and syrup in a saucepan gently until all melted together. 3. Remove from the heat and add the dry ingredients to make a dough. 4. Make into balls about a 50p size – do not flatten. 5. Bake for 10-12 minutes or until golden brown. 6. Allow to cool and try not to eat them all! If you try them out, let me know. I also made some chocolate chip versions with a smaller amount of golden syrup and they seemed to stay softer for longer. So do play around with the recipe and let me know what you get up to! I like your thinking Rhiannon, I think the same thing! They are really really moorish aswell.